I can’t tell you how hard it is to actually just come up with only fourteen things you need to know about Busch Gardens Tampa because it is so incredible. 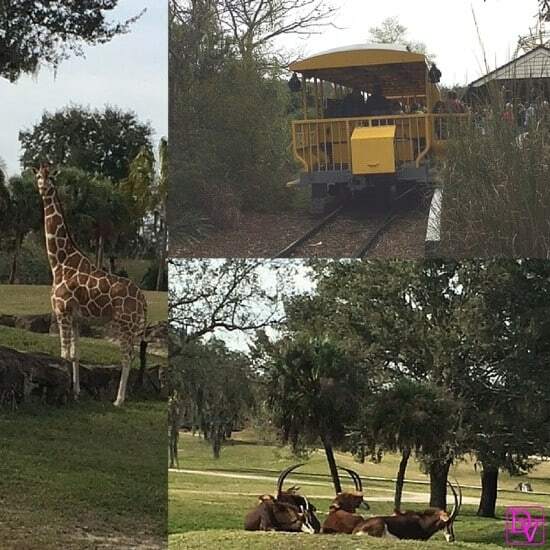 Whittling down this post was so hard because Busch Gardens Tampa is quite the destination. This was our first time to Busch Gardens and I was really curious as to how we would fare comparing it to other parks. We travel so much and have been to so many parks, but this is a very nice family destination that offers something for everyone. Honestly, my kids were at the perfect age to enjoy wish Gardens in Tampa from the coasters to the food and everything in between we truly enjoyed our day. My tween and teens definitely got their ride on, found adventure, enjoyed shows, went on Safari and of course ate their way through the park. Even better look at the smiles, a rarity on tweens and teens. How better to bring a smile to teens and a tween than to give them passes to Busch Gardens and let them experience it all. Lavishly live travel out loud and join in as I offer up 14 Things You Need To Know About Busch Gardens Tampa. With our tickets in hand, and the ticketing centers waiting for us, we walked right up and scan our tickets. In addition I had purchased a few all day passes for dining which was probably one of the smartest things I have ever done. We scan our tickets and we went right through the entrance gates and that is where the adventure begins. I grabbed a map and then began planning our day which I had already planned out before we got there, but really needed to gain my bearings. I had read so many reviews about Busch Gardens and nothing I read was further from the truth. People reviews online were complaining that they could not find ride entrances and that they could not easily navigate the park, and all I can say is Oh Hush Up! What I would like to do is offer you a few tips to navigate through the park, the thing is we are all different people so what works for us may not work for you. Remember I have 2 teens and a tween and they are all about the rides, food and attractions. My husband and I love the rides and we love to enjoy the ambiance, so our plan was as follows. My plan was simple we were going to head right to the back of the park to the land of Congo and then work forward, this way we were certain to get the opportunity to ride all the coasters. There were a lot of people at the beginning of the park, right past the ticketing and bag check entrance, it was totally congested, and the more we were in it the more agitated I was getting. When you first enter into the park you are in Morocco. My husband suggested we step to one side and when we did, I smelled something heavenly and we saw the ever-necessary ladies and men’s room! Breakfast began calling our name and that is where this adventure shall begin. We were standing in Morocco and then it hit me we were by the Zagora Café. Not certain if my son with food allergies could eat we did not buy him a dining pass, we simply purchased his food. My other kids had dining passes and they had a blast with it they went up and got themselves breakfast and we grabbed seats. There were no lines and there were plenty of choices. The food was Fantabulous. Toast, juice, desserts, putting, Jell-O, fruit, coffee or tea there was anything you could really desire and I’m so impressed that there were no lines. #2 Head For The Back Of The Park, Or Try To! After we ate our next stop was going to go right to the back of the park to visit Congo, however I think Busch Gardens had other plans for us because we kept stopping along the way. We bypassed Sesame Street Safari as it was not quite age-appropriate for my kids however it was very pretty to look at. 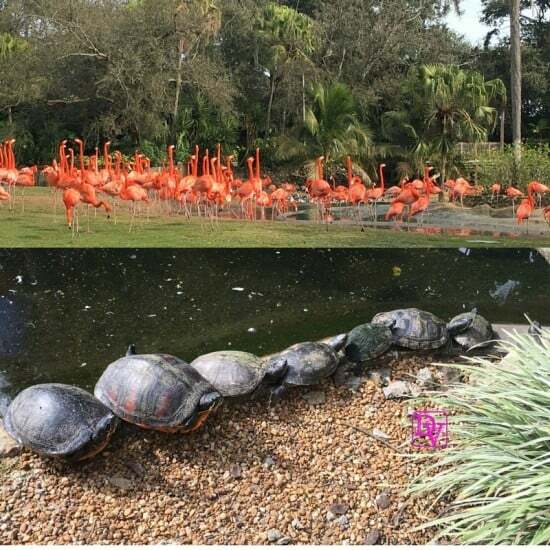 We stopped and look at the animals we saw turtles, flamingos and many beautiful gardens. The photo opps are endless. As we continued down the path we came upon Stanleyville. 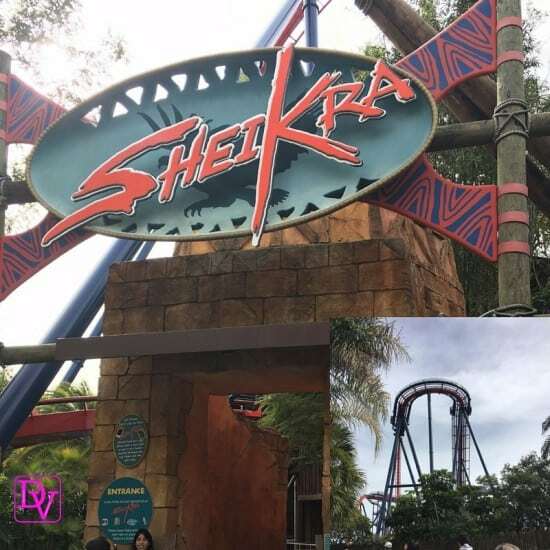 In Stanleyville there is Sheikra– it is a coaster that coaster fanatics crave. This is a 200 feet up and a 90° straight down with a zero floor ride. My husband and my boys saddled up for this one and they could not get enough it is such an adrenaline rush. Thankfully the lines were light so they got to ride it multiple times! 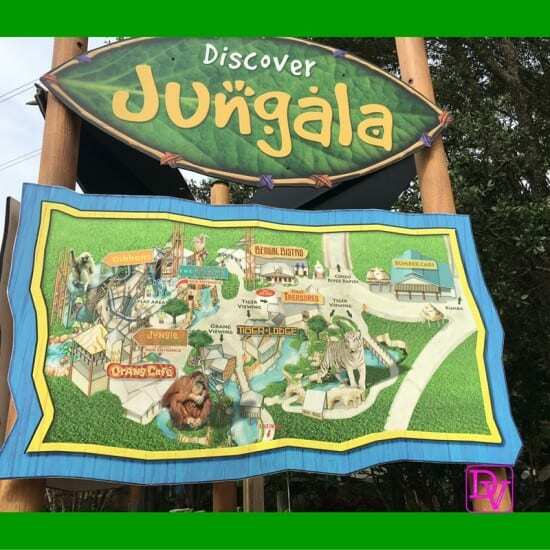 It is easy to navigate from land to land at Busch Gardens Tampa so we just continued on our trail heading back towards Congo however we ended up stopping in Jungala. The Map will guide you through the park, and pretty much once you start heading to the back of the park, even if you veer off and head towards Jungala, no matter what path you take you end up back at Congo. Now we saw this little fella it’s an orangutan swinging around off of its vines and then we went ahead and continued on our way. We passed yet another place that the all day food passes work that it was known as the Bengal Bistro and it smelled delicious. I knew some of Team Vento was going to eat there just by the look on all of their faces! We walked across the bridge and we ended up at KUMBA which is in CONGO! Woot Woot. In CONGO you will also find the Congo River Rapids and the bumper cars. I actually stopped in at Congo River outfitters and bought myself a light hoodie one I have been searching for all over the place only was successful in finding at Busch Gardens in Tampa. The Congo Area does not have dining in it, but it does have rides which your family will LOVE! My whole family got in line to ride on KUMBA and before you knew it we were having a blast. This is a 100 foot plummeting coaster and it has a 360 degree spiral and moves at 60 mph. It is a very smooth ride though I will tell you it is not for those that have light stomachs as the twisting is fantastic. We survived and there were smiles on everyone! So, the KUMBA is something and it might take you back just a bit if you were not expecting the multiple spirals, so take a walk to Pantopia, which is the next land to visit in Busch Gardens. We continued on and we were headed to Pantopia. On the way over the bridge I really enjoyed the beauty of these flowers. The cool thing about Busch Gardens is you don’t need to ride to have fun, simply walking the park is entertainment on its own as well and so pretty. The theme park has beautiful landscaping and architecture built in. Every time I turned my head I found something else to distract me as it is simply lovely and so very clean. Once over the connecting bridge you enter a wonderful land and again another coaster and a few other fab rides. I went on the SandSerpent with my kids and survived the coaster I will tell you when I came off of this one I wasn’t feeling at my best I think I already pushed my luck a bit too much LOL. The coaster does not look like it will abuse you, but after a few other coasters, and a total fear of heights, I was done, or so I thought. Now the kids, the tween and teens, they rode this again, and again and again. Wow, I feel like a loser even writing that I fizzed out. But that is fine because it led me to discover The Dragon Fire Grill and Pub for total yum yums! The Dragon Fire Grill and Pub is yet another place that you can use your all day dining deals if you bought them. 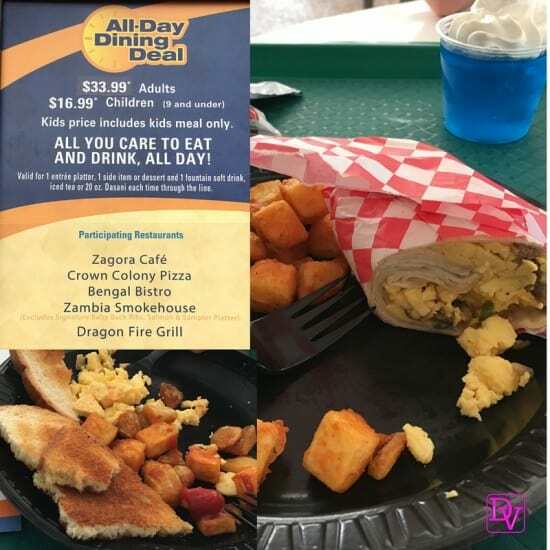 While the kids were riding, over and over, my husband and I went in and scouted out the different meals that were available with the all day dining deal. First let me tell you something, get there early because this is a very busy restaurant. Second, eat, and then eat again, because there are a lot of great food offerings here. What makes the Dragon Fire Grill and Pub so popular? Inside this location is a show that takes place a few times a day while you’re eating and you can sit there and watch the show or you can sit there and eat and watch the show. The show is great and it is called the Treasures Of The Mirage. Music, dancing, and very skilled performances will keep your meal very interesting, as will finding a seat if you come late, so get there ahead of the showtimes and hunker down! My simple suggestion is to eat ahead of the crowds in order to ensure you get a seat and are able to also enjoy the show. Right in the same area is Falcon’s Fury. If you were looking for quite the adventure this is it because you’re going to climb about 300 feet up, and then once you’re up you pivot in mid air you look straight down at the ground, it was crazy fun! Then, you plunge this is just amazing and the screaming that went on throughout the park, sorry but no one in my crew rode this, the face down factor freaked 2 of them out and the third did not want to go by himself. Me, I am just a flat out sissy and height hater, so thanks but no thanks. That should tell you how great this ride is for all of you thrill seekers! This was a stopping point for us we were all rather hungry as this was a few hours into our trip at this point so our decision to yes, eat again was quite important. This is where our family had to split into two because everybody had different wants for lunch. This is also the perfect way to use those bands that you buy for the all day dining. Two of our group went back to eat at the Bengal Bistro they grab burgers and fries. The rest of us headed into the Dragon Fire and Pub Grill. We regrouped after lunch and we headed forward to the train station in Nairobi. We thought it might be prudent to let our stomachs rest a little bit before tackling anymore coasters as we had just eaten. The train gave us a great view of the Serengeti Plain and we got to see many of the animals that were roaming about and had great photo opportunities. If you take the whole train-ride it is about a half hour round trip as you do stop it if you stations and they wait to fill up and then Move On. Sometimes the animals want to cross, and the train will come to a halting stop so make sure you are sitting. Once we got back all I can tell you is that my curiosity was truly piqued for the Cheetah Hunt Coaster. We had seen more of the coaster’s layout while on the train ride and it was time to face my fears again and embarrass my family. 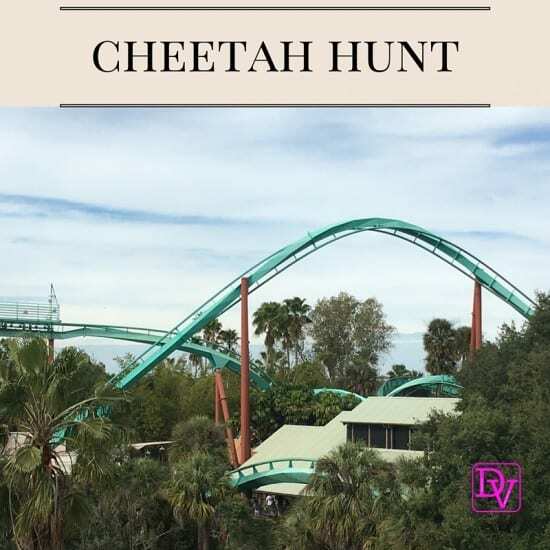 The kids could not wait to get there as the Cheetah Hunt Coaster is a race across the Serengeti and it has a triple launch. There were a few loops in this as well, and I screamed like a baby the whole time (that is why I apologized to my family before I got on because I knew I would embarrass them, lol!) You actually go uphill it over 60 mph which is something different than I’ve ever done before. Let’s just suffice it to say that the team tween and dad coaster junkies road this three times until they got it out of their system. It is quite awesome.You ride in pairs, so plan accordingly. I’ll back up for a second and tell you before we got there we did stop to see the cheetahs this was so cool and I got some really great video footage. I can’t believe how close we got , well through the glass, and we enjoyed this animal encounter. We have been to so many zoos and we live nearby and go to the Pittsburgh Zoo, but this was nothing like that, it was far more personal and interactive even though they are looking at your through glass, take a look at what I mean. Since we were at the Cheetah Hunt I insisted that it was MOM time and I wanted to go to the Skyride. To me, this is like riding a ski lift and my fear of heights kicks in big and bad, but I just go! 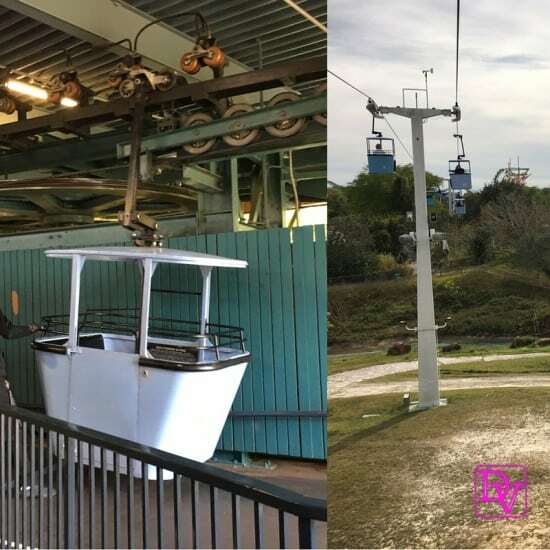 The Skyride lets you glide over the Serengeti Plain and enjoy the park at a bird’s eye view. Now, a few things about this ride: 1) You can have up to 2 adults and a child or just 2 to a gondola, so make sure to plan for that. Don’t rock those gondolas either. I captured some wonderful video footage to share with you. 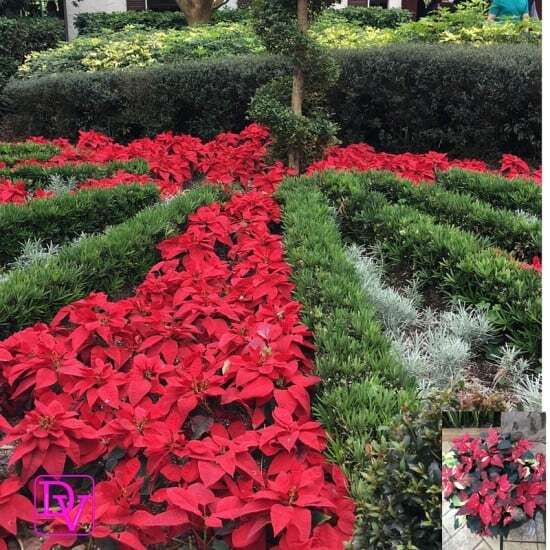 It seems that everywhere I looked in Busch Gardens with something more lush, more tropical and more green and I could not stop looking moving my head about him taking in the brilliance of this park. Busch Gardens is a true family park as there is something for every age. If you don’t like to ride there are beautiful gardens plenty of food plenty of shows in so many different animals to gaze and stare at. There are great places to sit and stop in plenty of places to rest and use the facilities. I did not feel badly if I sent my kids to a right and I sat back with my husband because we knew that they would be happy when they came off and we felt secure in that decision. The staff at the park goes out of their way to make sure you are happy. I stopped a few people asking some questions about directions or good times to get on a ride in really there were no bad times as we were there in January so we got to experience everything. Remember being a kid and that craving for One Last Time and let it happen. On the way out of the park of course the kids needed to get more of their SheiKra experience in so they rode it one last time. As a side note Zambia smokehouse yet another place you can eat with your all day dining was located right here in Stanleyville and oh my goodness did the food smell great. They had three different types of wood they were burning their wood fire grill with and it smelled awesome. Unfortunately our stomachs were already filled through eating and drinking all day long I wish we would’ve use this option so I could’ve shared it with you as well but I don’t think you can go wrong based on the smells. I guess you want to know if we are going to be going back? All I can tell you is my children have already requested this as a two day experience next time around. I understand why there is something for everybody in our family to take in and to enjoy. 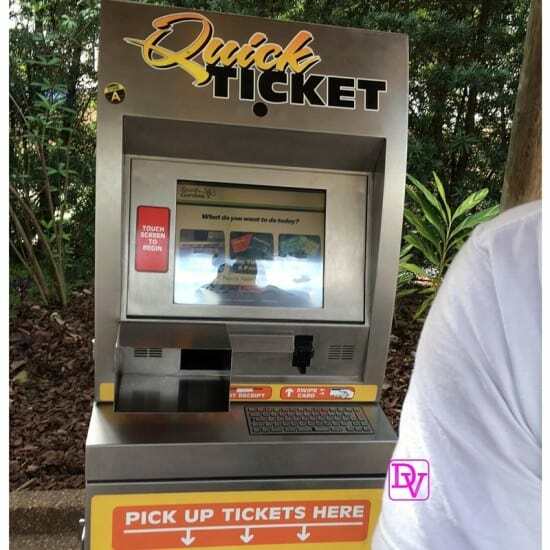 14 Things You Need To Know About Busch Gardens Tampa are meant to help your journey through the park so you get all the highlights and enjoy every nook and cranny just as we did. 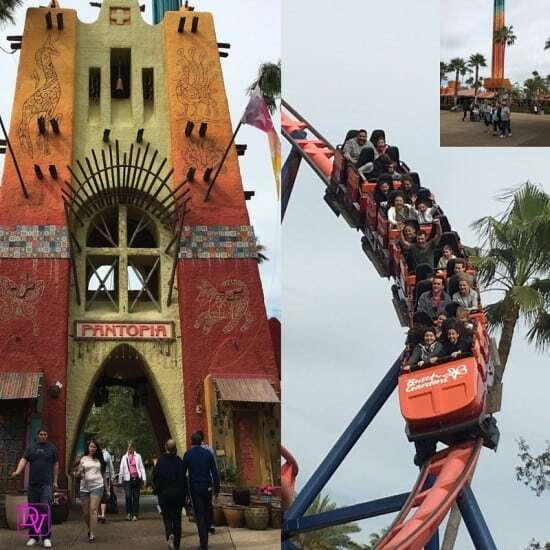 Lavishly live your time in Busch Gardens out loud, screaming on the coasters, dining on fun food and enjoying shows as Busch Gardens is a true family fun theme park with something for every genre. Are you craving more adventure? Check out these articles for more travel fun. Busch Gardens is my #1 theme park. 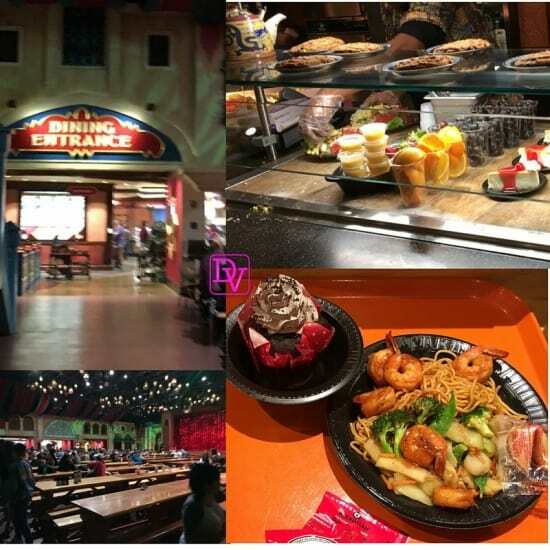 The beautiful theming, impressive collection of animals, food quality/selection and attractions beat Universal and Disney. There really is something for everyone at this world class Tampa park. Only complaint is the stage shows are not as good as they once were. This is especially true at the impressive Moroccan Palace Theater, which currently houses an ice show. Doesn’t even compare to Katonga or Kaleidoscope, which were Broadway caliber productions. But the park is still a great experience. If you go, realize this place is huge. Plan on two days to see it all. Busch also owns the adjacent water park, which is also top notch. Great…you just made my bucket list even longer!! Wow that looks like a blast. I’m not too sure about some of those roller coasters. Maybe the ones that don’t go too fast I’d go on. Wow that looks like a blast. I’m not too sure about some of those roller coasters. Reading this reminded me there’s a Busch gardens not horribly far from my sister. When my girls are old enough we’ll have to plan to go when we visit. Reading this reminded me there’s a Busch gardens not horribly far from my sister. When my girls are old enough we’ll have to plan to go when we visit! This looks like a complete family fun place and everyone can be busy all day, especially love the slides. Florida is in our top bucket list. My husband’s eldest daughter lives in Florida as well. She has been in this beautiful place. I hope to visit it one day and explore. oooohhh I have to add this to my travel bucket list! It looks like super good fun. This looks like an awesome place to spend a day with family. My little guys would enjoy this so much. Thank you for sharing your beautiful photos! What an awesome place to visit with the family. I wanted to go there on this Spring vacations. seems like a really nice place. I would love to try this in the future! I first went to Busch Gardens at least 30 years ago. Then I moved to Tampa and went quite a few times. This is a pretty good guide! What an awesome and fun trip filled with adventure. There is so much to do there and you’re right, the kids are at the right age to enjoy all the attractions. They meal passes will definitely help you save more. Everything is awesome! It sure looks like fun. Everything you posted looks like something my family and I would love to go on save for the rollercoaster. The cheetah is something that I would want my son to see for sure and the gondola, I’d die of fear of heights. I haven’t been to a Bush Garden in over a decade. The last time it was the one in VA. They really are great amusement parks.. I have not been to the Tampa location in many years but I have been to the Virginia location a few years ago, sounds like they offer many of the same things! My family doesn’t live too far from the area. When my cousins were younger they went to Bush Gardens all the time. It was favored over Disney. Great tips for sure. I am not big on amusement parks but my kids are for sure. Not sure when we will get to Tampa but there in one in VA that I would like to take the kids to. Gosh, I wanted to get some time to go there on our last trip. Very good tips to know if I get back that way. I use to visit as a kid a lot and your post flooded me with memories! 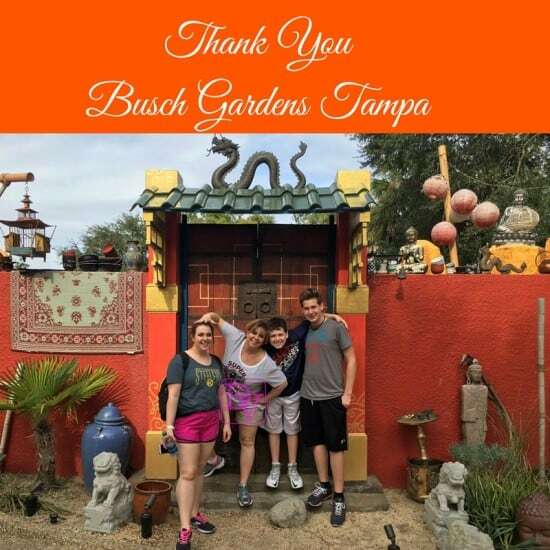 We’ve only traveled to Tampa once with the kiddos and hope to someday take them to Bush Gardens. Bookmarking this story to remember all the great tips. I love to go to Busch Gardens, I have a pass and go a couple times a month. I always purchase the All- Day Dining Deal. I think all of these things boil down to one major thing to remember about Busch Gardens. It’s fantastic! I absolutely love it there. I take pictures like a fiend! I was there about 10 years ago and would go back someday. We are a Disney family right now, though.